Frank Lambert was a French immigrant to the United States. 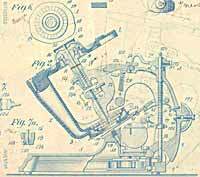 He started work on his typewriter in the 1880s, with the earliest patent dating back to 1884. The machine wasn't marketed until 1902 and it was obsolete before the first was sold. The Lambert typewriter is unique in shape and technology. It is the only keyboard typewriter (Except for the Phoenix) on which the keyboard consists of one single piece. On pushing a key, the entire keyboard and the attached type stamp (pic 6) swivelled into position and printed the correct letter onto the paper. 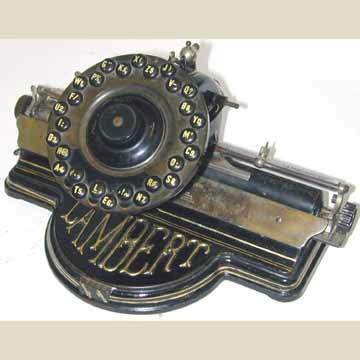 The Lambert is often mistaken for an index typewriter. There were three models of the Lambert Typewriter. The first 3000 machines had a keyboard that could be rotated to the left and right, to allow it to write a crude form of italic letters. In fact they were normal, Roman style letters printed at an angle. This feature was dropped on the Lambert 2 (after serial number 3000) that had a fixed keyboard. 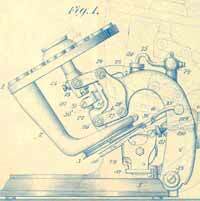 The machines were otherwise identical, with the embossed name on the base plate. A small handle to the left, under the keyboard (pic 5) allowed for 'shifting' - it put the stamp in position to print either lower case, capitals or figures. The Lambert 3 also appeared as the Butler and the Garden City. Outside the United States the machine was produced in London by the Gramophone and Typewriter Company, and in Lambert's home country France. For more details, see page 196 of the book TYPEWRITER.